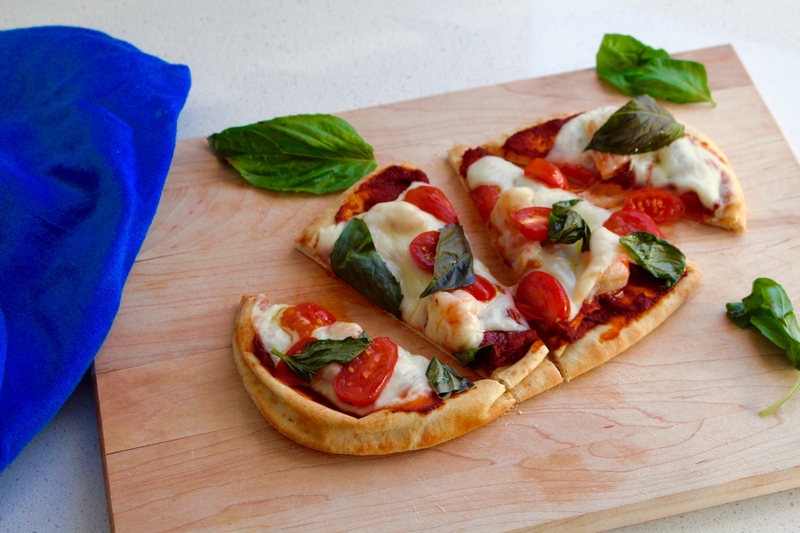 Pizza is a commonly named comfort food. And once in awhile a greasy deep dish is just what a person needs. But sometimes we simply want a healthier version of our comfort favourites, OR a quick and easy meal that's going to taste good! This simple pizza will be hitting your mouth in 25 mintues tops - faster than most delivery options. I love this pizza because it uses fresh ingredients, it's lower in sodium and fat, and it's not too heavy - hits the spot so-to-speak. 1) Mix the tomato paste with the basil, oregano, salt and garlic powder (much less sodium than found in a premade pizza sauce). Spread the sauce over one side of each piece of naan bread. 2) Add the cooked shrimp, the provolone, and the tomato slices on top. 3) Bake at 375F for 10-12 minutes. Remove and add the basil and a drizzle of olive oil on top of each pizza. 4) Optional to broil the pizzas (watching carefully) until the basil and cheese starts to brown.